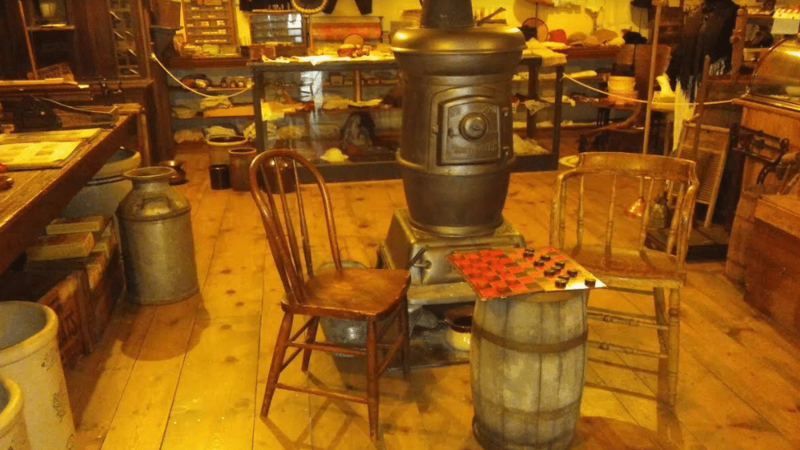 Like the classic movie, “It’s a Wonderful Life!” the indoor Walk-through Village in the museum Annex transports you back to small-town America, where Main Street was lined with shops and the checkerboard was always set up in the general store, ready for a game. The first stop on the left is the Apothecary, complete with carved wooden indian statue outside. Inside is a soda fountain with wooden stools, a cigar counter and toiletries counter. Behind a wood and frosted glass partition, the druggist formulated medicines using ingredients from small glass bottles lining the shelves of the back wall. Next door is the doctor’s office, with instruments and medical books that belonged to Dr. John Henry Britts, who had a practice in Clinton after the Civil War. Around the corner is the Tonsorial Parlor (haircuts – 25 cents, shave 15 cents), featuring a tin bathtub. Across the street is the law office with furnishings from the family firm of James Parks, Peyton Parks and James A. Parks of Clinton. The general store next to it offers pickles and crackers in barrels, coffee beans and flour in sacks, sewing supplies and household utensils. A one-person post office booth in the corner of the store provided a place to send and receive mail and buy stamps. Step next door to the store and you are in the Farmers Bank of Osceola, from which the interior was moved. The curved wooden counter by topped glass dividers and lined with ornate metal grillwork. The surfaces of the bump-out transaction bays are marble. Through swinging doors behind the counter are two teller stations, two desks, a floor safe and a wall safe. A small harness and leather goods shop completes the businesses in the Village. Parked in front of the harness and leather goods shop is a 1907 International car known as an “Auto Wagon”. For a close-up look of the interior of a pre-World War I American home go to the middle room of the Anheuser-Busch Building. The lady’s parlor features a square grand piano, decoratively painted parlor safe and an Edison phonograph. Low chairs and an Eastlake rocker provided a place to sit and do needlework. The foot warmer, filled with coals, was for inside or carriage use. Next to the parlor is the kitchen with dry sink, cook stove and kerosene ceiling lamp. The table and shelves hold utensils used in food preparation. Hand-cranked butter churns and a treadle sewing machine are among the labor-saving devices for household use. The child’s bedroom has antique dolls and doll buggies, toys, clothing, a fold-up child’s bed and a traveling trunk. The other bedroom features furniture from members of the Avery family who were one of the first settlements in Henry County.